The police have confiscated almost 1.000 marihuana plants and a big number of firearms during three raids. 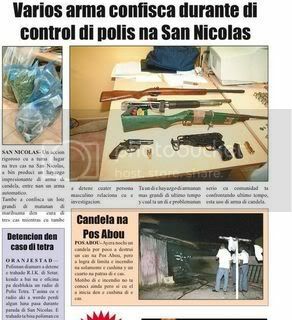 SAN NICOLAS – During raids in homes in San Nicolas yesterday, a special unit of the police corps ran up against four marihuana plantations and a considerable number of firearms, including a semi-automatic Uzi. They arrested five persons, some of them well-known by the police. The police action focused on the areas in Savaneta and San Nicolas and four houses at the Golfweg, Nijhoffstraat, Weg Fontein, and in Jara were raided and the marihuana plantations were discovered. The police confiscated almost 1.000 marihuana plants. Further search also delivered a great deal of firearms, including pistols, rifles, the semi-automatic Uzi, and a considerable amount of ammunition. The plants, the weapons, and the ammunition were taken to the police station in Oranjestad for further investigation and to be destroyed. The action of the Team Proyectonan Special ( TBP ) was part of a stricter approach of drug criminality; the result of one of the priorities that the police have set this year, namely pushing back the drug criminality. “We are very pleased with the result and we hope that the Public Prosecutor cooperate in this case and prosecute the persons we have arrested”, said Police-inspector Vanessa Kock. Photo accompanying this article shows the same 5 weapons. Here are IDs for those other than Lorenzo and the Winklaars. All of these photos were in the 06/21/2007 edition of Diario. It seems that Rasta and Blonchie are two different Vrolijks. No photo thus far of the other person who was identified only by initials. (C.H.). 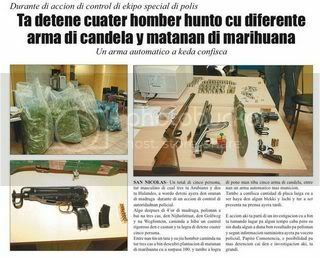 More of the same from the bust at Lorenzo's house..Big bag's of dried leaves and weapons are shown in these pics. The dried leaves were saved for probably making canabutter or hash. A lot of bags were needed for carrying off the almost 1000 confiscated marihuana plants. 898 PLANTS, not kilos, of marijuana. In the order the initials are listed above (which IS alphabetical), those arrested were Lorenzo van Rijn, Blonchie Vrolijk (I assume this to be ""J.V. "), Rasta Vrolijk, and D. Winklaar and M. Winklaar (they are father/son). Exactly five firearms. (3 at Blonchie Vrolijk's, 2 at the Winklaar's). Charges are "hemp, firearms, live cartridges" ... no other drugs mentioned in any report I've seen. What is NOT clear (to me thus far) is what happened with "R.T." (Madiki) and "C.H." (Dakota), who also were hauled in during this operation. Re. the article "AUTO" - clarifies a previous post that mentioned, among other things, the burning of a car at the police station. "barbwire". 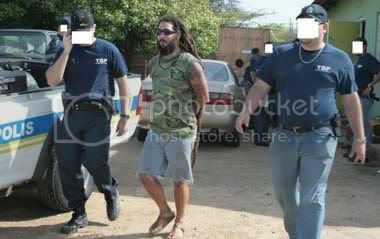 Lorenzo van Rijn has been detained for planting marijuana at his house in Savaneta. Lorenzo van Rijn is not unknown by police. During the search of Special Project Team did a search at different houses, and LVR's was no exception. He lives at Jaraweg and at his house the police had a hard time entering his house. The house is surrounded by wire, surveillance camaras all around and some monster dogs in his property. Besides all these obstacles, police did manage to enter the propery with shotguns in their hands to defend themselves against these fierce dogs. Marijuana was even hidden in a cooler inside his house. Different expensive cars were searched in his property. In a private discoteque they found marijuana while an icejug full of money was confiscated. Lorenzo told police the drugs were of his own use. On the pics one can see more of the action at his house at Jaraweg. Diadomingo marduga rond di 3'or mayoria patruya di polis a dirigi nan mes pa Carlos N Charlies pa un bringamento. Polis ta logra na detene un total di 4 persona cu a wordo transporta di immediatio pa warda di Oranjestad. Click read more pa mas imagen. diadomingo marduga rond of 3'or majority patrol of police owing to dirigi they self for carlos n charlies for one bringamento. police is succeed at detene one overall of 4 person cu owing to wordo transporta of immediatio for keep of oranjestad. click read more for more imagen. Despues cu a start un pelea na Carlos 'n Charlies polis a detene 4 persona. Despues cu nan a wordo procesa a pidi pa Ambulance bay na warda di playa pa asina duna asistencia medico. Ambulance a yega y a baha pa duna asistencia. Despues di a mira e situacion nan a disidi di hiba e personanan en cuestion hospital. Debi cu e personan aki ta deteni a rekeri pa polis sali cu su patruya dilanti di e ambulance pa asina por bay huntu pa hibanan pa hospital pa nan por a ricibi tratamento medico na poli. after cu owing to start one action at carlos 'n charlies police owing to detene 4 person. after cu they owing to wordo procesa owing to ask for ambulance bay at keep of beach for so give asistencia medico. ambulance owing to arrive y owing to descend for give asistencia. after of owing to see the situation they owing to disidi of take away the personanan provided that cuestion hospital. debi cu the personan here is deteni owing to rekeri for police leave cu his patrol fast of the ambulance for so can bay together for hibanan for hospital for they can owing to ricibi tratamento medico at poli. Diadomingo merdia strandpolitie ta pidi asistencia medico pa un turista masculino cu lo ta sufriendo di un atake di curason. Unidad di EMS a wordo manda pa e sitio unda cu ora cu nan a yega tawatatin un persona ta duna CPR pero sin exito. EMS a transporta e persona pa hospital. Inoficialmente nos por compronde cu nan no a logra pa reanima e turista. Dentro di algun minuut video y imagen exclusivo. E suceso aki a tuma lugar un poco prome cu boca catalina. diadomingo afternoon strandpolitie is ask asistencia medico for one tourist masculino cu will is sufriendo of one atake of curason. unidad of ems owing to wordo send for her sitio where cu hour cu they owing to arrive tawatatin one person is give cpr but without exito. ems owing to transporta the person for hospital. inoficialmente we can compronde cu they not owing to succeed for reanima the tourist. dentro of some minuut video y imagen exclusivo. the suceso here did take lugar one some first cu mouth catalina. All of these are from Saturday, June 23, Diario. ORANJESTAD (AAN) – Matutino DIARIO a entrevista señor Candelaria di e Departamento Hudicial di Cuerpo Policial, kende ayera mainta hopi tempran tabata riba pia caba y nos a puntre ta cual ta e motibo. Señor Candelaria a duna di conoce cu ayera mainta tempran nan a bay detene e persona cu polis ta sospecha di ta esun cu a cende na candela e patruya. Polis ta mustrando asina cu nan no ta acepta e tipo di actonan asina, y nan a forma un grupo special cu ta bezig trahando riba e caso concerni, y di e manera aki nan ta deteniendo un pa un esnan cu ta responsable di e delito cometi. E sospechoso ta un mucha homber jong, di inicialnan R.A.M naci na 1987, kende a keda cera pa interogacion. Señor Candelaria a indica cu pa polis e asunto aki ta hopi serio. Tur biaha cu un hende ta horta algo of ta pega auto na candela polis ta tuma esaki hopi na serio, pero yega asina leu di bay cu un auto di polis y cende na candela esey ta sumamente serio, y e cargo contra e hoben aki cu el a horta un auto di polis y el a cende na candela. Como cu e persona aki, polis a haya informacion cu por ta na diferente adres, nan a bay tur adres cu nan a haya pa mas sigur, pasobra un hende asina no por a scapa for di autoridad. E investigacion ta sigui y polis Candelaria no ta descarta cu lo por tin mas detencion. E mucha homber aki no ta desconoci pa husticia, ya cu el a cay deteni caba pa diferente delito. Como cu e tin diferente sla na su curpa, polis lo determina cual ta e motibo di esakinan, segun sr. Candelaria a menciona. oranjestad (aan) – matutino daily paper owing to interview sir candelaria of the departamento hudicial of cuerpo policial, that yesterday morning much early was on leg end y we owing to puntre is cual is the motibo. sir candelaria owing to give of conoce cu yesterday morning early they owing to bay detene the person cu police is sospecha of is esun cu owing to light at candela the patrol. police is mustrando so cu they do not acepta the type of actonan so, y they owing to form one are special cu is bezig trahando on the caso concerni, y of the as here they're deteniendo one for one esnan cu is responsable of the delito cometi. the sospechoso is one boy jong, of inicialnan r.a.m naci at 1987, that owing to stay close for interogacion. sir candelaria owing to indica cu for police the asunto here is much earnest. all trip cu a is steal algo or is stick car at candela police is take this much at earnest, but arrive so far of bay cu one car of police y light at candela esey is extremely earnest, y the cargo contra the young here cu past owing to steal one car of police y past owing to light at candela. because; cu the person here, police owing to achieve informacion cu can is at various adres, they owing to bay all adres cu they owing to achieve for more assure, because a so not can owing to scapa for of autoridad. the investigacion is follow y police candelaria do not descarta cu will can have more detencion. the boy here do not desconoci for husticia, already cu past owing to cay deteni end for various delito. because; cu the have various sla at his curpa, police will determina cual is the motibo of esakinan, according sr. candelaria owing to menciona. Polis a scual funcionario di CEA cu a ofende un mucha di 13 aña.. ORANJESTAD. (AAN): Un homber grandi a scapa a base di su profesion ya cu e mester sa su limite di a ofende un criatura di 13 aña. Polis a pone e homber di inicialnan PK. Di 30 aña na su lugar y a recomende pa mihor e bay pidi disculpa na mayornan y e mucha homber. Segun e informe policial , na warda di polis a presenta un señora mama di un hoben di 13 aña cu ta bayendo school. E mama ta splica polis, cu su yiu homber a bise cu un homber grandi a busca e mucha problema E homber P.K. para dilanti school yama su yiu homber pa M, bise tambe pa bay corta cabey enfin papia yen di coi loco cu e criatura. Yiu di e señora a spanta pa e actitud di e homber ya cu e lo a wak un arma di candela parti patras di e vehiculo di P.K. E yiu tabata na yoramento y cu miedo di e homber. E dia despues., Diaranzon, atrobe e yiu a bay school y bolbe cas na yoramento, nan lo a bise cu e homber lo ta traha na CEA. A base di e informenan compila a polis a yama director di CEA y a confirma cu tin un tal P.K. den servicio y a check alaves cu e port a dispone di arma di candela. E director a duna di conoce cu P.K. no tin permiso pa cana cu arma di candela. Polis a logra di localiza e homber P.K, cu a admiti di a tenta e mucha homber cu e conoce debi e mucha ta den klas di su subrinanan. Polis a scual P.K. riba su forma di proceder y comportacion e como hende grandi di ta actua asina. A busca den su auto si lo descubri arma di candela esaki no tabata e caso si P.K. ta dispone di un klop como parti di su empleo na CEA. Polis a recomenda e homber mihor e bay papia cu mayornan y pidi su disculpa pa caba cu e asunto. police owing to scual funcionario of cea cu owing to ofende one child of 13 year.. oranjestad. (aan): one man big owing to scapa owing to base of his profesion already cu the have to know his boundary of owing to ofende one criatura of 13 year. police owing to place he of inicialnan pk. of 30 year at his lugar y owing to recomende for mihor the bay ask disculpa at parents y the boy. according the informe policial, at keep of police owing to present one madam mother of one young of 13 year cu is bayendo school. the mother is splica police, cu his son owing to bise cu one man big owing to busca the child problem he p.k. stop fast school calling his son for m, bise also for bay clip cabey enfin talk complete of coi loco cu the criatura. child of the madam owing to spanta for her actitud of he already cu the will owing to look at one arm of candela part behind the vehiculo of p.k. the child was at yoramento y cu fright of he. the day after., diaranzon, again the child owing to bay school y go back cas at yoramento, they will owing to bise cu he will is work at cea. owing to base of the informenan compila owing to police owing to calling director of cea y owing to confirma cu have one such p.k. in servicio y owing to check alaves cu the port owing to dispone of arm of candela. the director owing to give of conoce cu p.k. not have permission for march cu arm of candela. police owing to succeed of localiza he p.k, cu owing to admiti of owing to tenta the boy cu the conoce debi the child is in class of his subrinanan. police owing to scual p.k. on his form of proceder y comportacion the because; person big of is actua so. owing to busca in his car if will descubri arm of candela this not was the caso if p.k. is dispone of one klop because; part of his empleo at cea. police owing to recomenda he mihor the bay talk cu parents y ask his disculpa for end cu the asunto. ORANJESTAD(AAN): Diabierna mainta S.J.H.M a presenta dilanti di huez comisario, pa prolongacion di su detencion. S.M a wordo deteni y acusa recientemente cu el a cende un toyota starlet na candela, riba tereno di warda di polis na Santa Cruz. E auto aki a wordo tuma den beslag despues di e caso di tiramento na macuarima, den cual diferente persona a wordo deteni caba. S.J.H.M su detencion a wordo prolonga cu 8 dia. oranjestad(aan): diabierna morning s.j.h.m owing to present fast of huez comisario, for prolongacion of his detencion. s.m owing to wordo deteni y acusa recientemente cu past owing to light one toyota starlet at candela, on territory of keep of police at santa cruz. the car here owing to wordo take in beslag after of the caso of tiramento at macuarima, in cual various person owing to wordo deteni end. s.j.h.m his detencion owing to wordo prolonga cu 8 day. ORANJESTAD(AAN): Diabierna Gilbert Errol Frederick Arends y Robert Ruben Fortin a presenta dilanti di huez despues cu nan a wordo acusa di falsificacion, fraude y malversacion. Nan a wordo acusa cu nan lo a comete e actonan aki, na nan trabao na BSL Laundry. E acusacionnan ta di e periodo entre 2004 y 2006. Arends ta deteni for di 6 di January 2007 y Fortin a wordo deteni riba dia 11 di January. Fiscal Diabierna a pidi huez pa pospone e caso, pasobra e parti di investigacion pa determina ken di e dos acusadonan a inicia e actonan criminal, no ta cla ainda. Huez a bisa cu den un otro caso di malversacion, e acusadonan no a haya mas di 5 luna di castigo, pues mirando cu e acusadonan aki tin ya caba mas di 5 luna cera y probablemente nan lo no haya mas castigo incondicional, el a dicidi di laga nan den libertad, pendiente di tratamento di e caso. E caso lo bin dilanti dia 31 di Augustus. oranjestad(aan): diabierna gilbert errol frederick arends y robert ruben fortin owing to present fast of huez after cu they owing to wordo acusa of falsificacion, fraude y malversacion. they owing to wordo acusa cu they will owing to comete the actonan here, at they trabao at bsl laundry. the acusacionnan is of the period among 2004 y 2006.
arends is deteni for of 6 of january 2007 y fortin owing to wordo deteni on day 11 of january. fiscal diabierna owing to ask huez for pospone the caso, because the part of investigacion for determina that of the two acusadonan owing to inicia the actonan criminal, do not cla still. huez owing to tell cu in one another caso of malversacion, the acusadonan not owing to achieve more of 5 month of castigo, then mirando cu the acusadonan here have already end more of 5 month close y probably they will not achieve more castigo incondicional, past owing to dicidi of let they in freedom, pendiente of tratamento of the caso. the caso will come fast day 31 of august. ORANJESTAD(AAN): Diabierna Wantu Wazuri Pamoya Cremony a presenta dilanti di huez, pa scucha sentencia den su caso. Cremony a wordo acusa cu intencionalmente e lo a kita bida di un persona na San Nicolas, door di hinke cu cuchio na su garaganta. Fiscal tabata di opinion cu Cremony a tuma su tempo pa tuma e decision di bay unda cu e victima tabata, pa hinke mata. Defensa a trece dilanti cu Cremony a actua den defensa propio, pasobra e victima tabata tin un arma tambe. Fiscal a exigi un castigo di 10 aña, sinembargo huez Diabierna a dicta cu Cremony ta wordo declara liber di asesinato premedita, pero culpable di homicidio(doodslag). El a dune 5 aña, kitando e tempo cu el a sinta caba. Huez a dune un splicacion tambe con el a yega na su decision. El a splica cu no tabata tin suficiente prueba cu e acusado lo a “sluip” yega cerca di e persona pa kita su bida. El a bisa tambe cu e polis cu a bin como testigo na corte, a lubida un parti crucial di loke tabata tin den proces verbal cu e mes a traha y esey a trece ainda mas duda den e caso aki, cu Cremony lo a comete e crimen aki na un forma premedita. Huez bisa tambe cu e no ta convenci cu Cremony a actua den defensa propio. Tambe ta asina cu Cremony mester tabata sa cu e echo cu el a hinca e persona na su garganta, por a causa su morto. Pesey el a wordo haya culpable pa causa morto di e victima y sentencia na 5 aña. oranjestad(aan): diabierna wantu wazuri pamoya cremony owing to present fast of huez, for listen sentencia in his caso. cremony owing to wordo acusa cu intencionalmente the will owing to less life of one person at san nicolas, door of hinke cu cuchio at his garaganta. fiscal was of opinion cu cremony did take his time for take the decision of bay where cu the victima was, for hinke kill. defence owing to trece fast cu cremony owing to actua in defence own, because the victima was have one arm also. fiscal owing to exigi one castigo of 10 year, sinembargo huez diabierna owing to dicta cu cremony is wordo declara pound of asesinato premedita, but culpable of homicidio(doodslag). past owing to dune 5 year, kitando the time cu past owing to sit end. huez owing to dune one splicacion also con past owing to arrive at his decision. past owing to splica cu not was have sufficient proof cu the acusado will owing to “sluip” arrive close of the person for less his life. past owing to tell also cu the police cu owing to come because; witness at corte, owing to forget one part crucial of thing was have in proces verbal cu the self owing to work y esey owing to trece still more doubt in the caso here, cu cremony will owing to comete the crimen here at one form premedita. huez tell also cu the do not convenci cu cremony owing to actua in defence own. also is so cu cremony have to was know cu the achievement cu past owing to hinca the person at his throat, can owing to cause his dead. pesey past owing to wordo achieve culpable for cause dead of the victima y sentencia at 5 year. I don't have time to try to be more "interpretative" of these post now. Other thoughts welcome. Well, here's one for today (Monday 6/25) ... grisly photos too. ORANJESTAD(AAN):Diadomingo marduga tabata tin un diferencia di opinion cu a surgi entre un grupo no local y polis. Ta turistanan cu ta na Aruba relaciona cu un actividad deportivo y polis a ser yama pa e problema. Na yegada e diferencia di opinion tabata asina grandi cu polis a bay over na detene tres di esnan cu tabata tin problema y bay cu nan warda. Na dado momento cos no tabata facil pasobra mester a haci uso di forza bruto y tin polis cu a resulta herida. Mescos tin un di e turistanan cu a cay y haya sla na cabez. DIARIO tabata presente y a logra fotonan di e problemanan cu tabata tin. Aunke ta ser bisa cu tabata tin hendenan cu a busca e turistanan deportista problema, esaki tog no por a ser confirma. Den oranan di mainta e turistanan a ser laga den libertad. E polisnan cu a keda levemente herida tambe mester a ser atendi medicamente. oranjestad(aan):diadomingo marduga was have one diferencia of opinion cu owing to surgi among one are not local y police. is turistanan cu is at aruba relaciona cu one actividad deportivo y police owing to being calling for her problem. at arrival the diferencia of opinion was so big cu police owing to bay over at detene three of esnan cu was have problem y bay cu they keep. at dado instant cos not was facil because have to owing to haci usage of forza bruto y have police cu owing to resulta injury. same have one of the turistanan cu owing to cay y achieve sla at cabez. daily paper was present y owing to succeed fotonan of the problemanan cu was have. although is being tell cu was have hendenan cu owing to busca the turistanan deportista problem, this tog not can owing to being confirma. in oranan of morning the turistanan owing to being let in freedom. the polisnan cu owing to stay levemente injury also have to owing to being atendi medicamente. I just got off the phone with my friend who went to Aruba last week and came back on Saturday. I said well how did you like it. She was very nervous about being robbed. She said she was so disappointed and would have to seriously think about going back there. I said when was the last time you were there and she said 3 years ago and it has changed so much. - She said one evening she went to a restaurant (El Gaucho) and she heard a couple talking about a break in. She went over to someone at the restaurant and asked what happened and apparently someone broke into their car (smashed their window) and took some stuff of theirs. - On the plane ride coming home she spoke to another woman and she left her stuff in the glove compartment and they took the whole car. This woman was frantic because she had no money and her credit cards were in the car. She said she filed a police report and it took them over an hour to respond. - She went to another restaurant and she found all these extra charges on her bill. She called the lady over and asked them to explain what one of the charges were and the woman said well this goes to the restaurant and this is for the employee’s salary. - She went to another restaurant and it seemed so desolate. She was very afraid. Someone suggested to her if you are going to go to this particular restaurant make sure you go at 5 before it gets dark. I know a family that was robbed over there while riding on one of the buses. A pickpocket cleaned them out,on the bus. Also, they rented a car and had to put a deposit of $500.00 down. When they took the car back, the rental place accused them of damaging the car (which they insisted they didn't) they did not get their $500.00 back. Aruba den estado di alarma! *A permiti scarcedad Polis alcanza 166! ORANJESTAD (AAN) — Polis a adverti pa loke ta pasando. Gobierno no a haci caso pero cu un sonrisa Ministro di Husticia a deshaci di e alarma cu Polis a bati lunanan pasa. Awor Aruba ta biba den estado di alarma, despues cu no e gangnan cu tabata conoci pero un gang cu a ranca sali inesperadamente ta pone Aruba biba den estado di alarma. E irresponsabilidad grandi di Gobierno, cu a gasta placa pa loco ariba celebracionnan, viahenan y tur loke por a causa un buraco grandi mientras ta ricibi BBO, ta resalta den e hecho cu e promer necesidadnan di Aruba no a worde cubri. A permiti e scarcedad di Polis alcanza 166 manera Ministro di Husticia mes a bisa y ta 15 e por tuma den servicio. Con Polis, manera Diasabra anochi por sigui traha den e situacion actual, mientras Pueblo ta biba den gara di miedo pa violencia, no ta conoci. 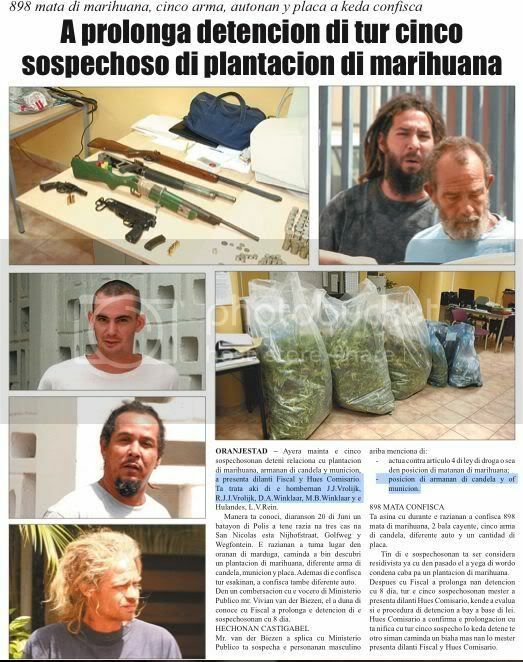 DIARIO a worde mustra ariba e gran realidad: criminalidad di Aruba no ta asunto mas di casonan individual manera pelea, pero Aruba a conoce e peligro mas grandi cu ta crimen organiza, mas dificil pa combati ora permitie haya raiz! For di temporada di Carnaval, Polis a haci su trabao di mustra Gobierno cu situacion ta sali for di man. Ministro di Husticia a haci bofon di e informacion cu el a ricibi y cu hendenan, cu manera semper tin pa sostene loke gobernantenan kier pretende, a produci supuesto cifra pa mustra cu ta algun crimen chikito so Aruba conoce. Awor cu e bom a rementa den man di Ministro di Husticia, cu aparicion di un gang sumamente peligroso, cu ningun hende tabata sabi cu ta existi na Santa Cruz, Polis y ciudadanonan mester paga pe. DIARIO ta worde inunda cu personanan cu ta acerca DIARIO pa mustra nan preocupacion grandi y e impacto cu e situacion actual tin den nan bida. Mayornan tin miedo pa muchanan bandona cas, pa nada no pasa. “Mi yiu semper tabata bay cu su amigonan. Awor no ta bay trip mas. Mi no por relaha te ora tur hende ta na cas,” un mayor preocupa a duna di conoce. E hecho cu Diasabra a pone henter un shift di Polis keda na trabao pa por evita otro explosion di violencia, a causa mas panico den Pueblo. Mas ainda pasobra ningun hende tabata prepara pa e violencia cu a manifesta su mes y demostra cu tin gang sumamente peligroso. “Bo ta tende di gang. Bo ta kere cu ta hobennan cu ta enfrenta otro. Pero tira otro, horta auto di Polis, hasta bay kima auto den cura di Centro di Husticia, ta algo hororoso,” un ciudadano a mustra. E ta uno di e grupo grandi cu ta teme pa nan bienestar personal, mas ainda pasobra no tin placa pa paga loke normalmente ta yuda evita criminalidad bati na bo porta. “Electricidad a bira caro. Bo no por cende luz manera bo kier. Gastonan ta enorme. Hende cu bon entrada so por tin un sistema di alarma. Bo ta sinti bo insigur den caya y insigur na cas,” un ciudadano a bisa. Mientrastanto Gobierno lo mester percura pa aumenta e cantidad di Polis. E total di 15 cu kier tuma den servicio, lo no alivia e situacion grave. Pueblo ta fada di scucha con Gobierno ta abusa di placa, manera e viahe di Nelson Oduber pa China. “Cada rato uno a bay otro lugar. Chofer. Bodyguard. Coordinador. Oficina. Y Pueblo nada,” a worde mustra na DIARIO. Den tur bario awor ta existi e temor cuanto gangnan scondi tin y kende ta duna nan yudanza. Hobennan ariba nan mes, no tin placa pa arma. Kico ta pasa na Aruba? Di un dia pa otro e isla ta den un estado di alarma, cu por a preveni si Gobierno a actua na tempo, manera a mustra DIARIO. aruba in estado of alarma! *a permiti scarcedad police alcanza 166! oranjestad (aan) — police owing to adverti for thing is pasando. gobierno not owing to haci caso but cu one smile ministro of husticia owing to deshaci of the alarma cu police owing to beat lunanan happen. now aruba live in estado of alarma, after cu not the gangnan cu was conoci but one gang cu owing to ranca leave unexpectedly is place aruba live in estado of alarma. the irresponsabilidad big of gobierno, cu owing to spend coin for loco upstairs celebracionnan, viahenan y all thing can owing to cause one buraco big while is ricibi bbo, is resalta in the mature cu the previous to necesidadnan of aruba not owing to worde cubri. owing to permiti the scarcedad of police alcanza 166 as ministro of husticia self owing to tell y is 15 the can take in servicio. con police, as saturday night can follow work in the situation actual, while people live in grab of fright for violencia, do not conoci. daily paper owing to worde show upstairs the great realidad: criminalidad of aruba do not asunto more of casonan individual as action, but aruba owing to conoce the danger more big cu is crimen organiza, more dificil for combati hour permitie achieve raiz! for of season of carnaval, police owing to haci his trabao of show gobierno cu situation is leave for of hand. ministro of husticia owing to haci bofon of the informacion cu past owing to ricibi y cu hendenan, cu as always have for sostene thing gobernantenan wanted pretende, owing to produci supuesto cifra for show cu is some crimen diminutive only aruba conoce. now cu the bom owing to rementa in hand of ministro of husticia, cu aparicion of one gang extremely dangerous, cu none person was know cu is existi at santa cruz, police y ciudadanonan have to pay pe. daily paper is worde inunda cu personanan cu is acerca daily paper for show they preocupacion big y the impacto cu the situation actual have in they life. parents have fright for children bandona cas, for nothing not happen. “mi child always was bay cu his amigonan. now do not bay trip more. my not can relaha till hour everybody is at home,” one parent preocupa owing to give of conoce. the mature cu saturday owing to place all one shift of police stay at trabao for can evita another explosion of violencia, owing to cause more panico in people. more still because none person was prepara for her violencia cu owing to manifesta his self y demostra cu have gang extremely dangerous. “bo is hear of gang. are you believe cu is hobennan cu is enfrenta another. but throw another, steal car of police, even bay burn car in cura of centro of husticia, is algo hororoso,” one ciudadano owing to show. the is uno of the are big cu is teme for they bienestar personal, more still because not have coin for pay thing ordinarily is help evita criminalidad beat at do you door. “electricidad owing to become caro. do you not can light luz as do you wanted. gastonan is enormous. person cu good entrance only can have one sistema of alarma. are you feel do you insigur in caya y insigur at home,” one ciudadano owing to tell. all the time gobierno will have to percura for aumenta the cantidad of police. the overall of 15 cu wanted take in servicio, will not alivia the situation important. people is fada of listen con gobierno is abusa of coin, as the viahe of nelson oduber for china. “cada rato uno owing to bay another lugar. chofer. bodyguard. coordinador. office. y people nothing,” owing to worde show at daily paper. In all district now is existi the temor cuanto gangnan scondi have y that is give they yudanza. hobennan upstairs they self, not have coin for arm. kico is happen at aruba? of one day for another the island is in one estado of alarma, cu can owing to preveni if gobierno owing to actua at time, as owing to show daily paper. ORANJESSTAD(AAN): Recientemente Andre Samuel Saladin a presenta dilanti di huez, despues cu el a wordo acusa di a menaza un famia. Ta asina cu e acusacion ta encera cu na April 2007, Saladin a tira algo cu mester tabata parce un Molotov cocktail den cura di hende. E acusado a bisa den corte cu el a yena un botter di cerbez cu awa y a pone un pida camisa den e botter, pa gaña hasi manera e tabata un Molotov Cocktail. El a splica cu e tabata tin sospecho cu e persona cu lo ta biba na e caso ey, a duna su sobrina un pildo, pa despues probecha di dje sexualmente. Saladin a splica cu e tabata bao di influencia di alcohol y e tabata convenci cu un persona bibando na e cas a viola su sobrina. Fiscal a pidi un castigo di 6 luna, kitando e 10 dianan cu el a sinta caba den detencion preventivo. E tempo cu resta mester bira un castigo condicional. Ademas di esaki e ta haya cu e acusado mester paga un multa di 1500 florin, of sinta 30 dia den KIA. Huez a trece dilanti e strafblad di Saladin cu tabata tin varios castigo di ladronicia na Hulanda y un castigo condicional pa intento di maltrato severo na Aruba. For di chikito Saladin a cuminza uza marihuana, despues di cual el a uza tambe ecstasy y cocaina. Abogado Vito Carlo defendiendo e acusado a bisa huez cu e ta haya cu Ministerio Publico a actua contra derechonan di su cliente, door cu nan a tene 10 dia deteni, sin cu esaki tabata necesario. Saladin a admiti loke el a hasi y durante e 10 dianan nan no a hasi ningun investigacion mas den e caso aki, pues nan por a lage bay mas lihe. Mirando esaki el a pidi huez pa declara e O.M “niet ontvankelijk”, pues pa laga su cliente bay, liber di acusacion. Fiscal a trece dilanti cu si bo kier pa Ministerio Publico wordo declara “niet ontvankelijk”, mester bin cu motibonan huridico bon splica. Huez den su veredicto a tene cuento cu loke abogado y fiscal a trece dilanti y a duna Saladin un castigo di 3 luna kitando e tempo sinta caba. E tempo cu resta ta bira un castigo condicional. Ademas di esaki e mester paga un multa di 750 florin, of sinta 15 dia na KIA. oranjesstad(aan): recientemente andre samuel saladin owing to present fast of huez, after cu past owing to wordo acusa of owing to menaza one family. is so cu the acusacion is encera cu at april 2007, saladin owing to throw algo cu have to was seems one molotov cocktail in cura of person. the acusado owing to tell in corte cu past owing to fill one botter of cerbez cu water y owing to place one piece camisa in the botter, for lie make as the was one molotov cocktail. past owing to splica cu the was have suspicion cu the person cu will live at the caso ey, owing to give his sobrina one pill, for after probecha of dje sexualmente. saladin owing to splica cu the was bao of influencia of alcohol y the was convenci cu one person bibando at the cas owing to viola his sobrina. fiscal owing to ask one castigo of 6 month, kitando the 10 dianan cu past owing to sit end in detencion preventivo. the time cu be kept in have to become one castigo condicional. apart from this the is achieve cu the acusado have to pay one multa of 1500 guilder, or sit 30 day in kia. huez owing to trece fast the strafblad of saladin cu was have several castigo of ladronicia at the netherlands y one castigo condicional for attempt of maltrato severo at aruba. for of diminutive saladin owing to cuminza employ marihuana, after of cual past owing to employ also ecstasy y cocaina. advocate vito carlo defendiendo the acusado owing to tell huez cu the is achieve cu ministerio publico owing to actua contra derechonan of his cliente, door cu they owing to as 10 day deteni, without cu this was necesario. saladin owing to admiti thing past owing to make y during the 10 dianan they not owing to make none investigacion more in the caso here, then they can owing to lage bay more lihe. mirando this past owing to ask huez for declara the or.m “niet ontvankelijk”, then for let his cliente bay, pound of acusacion. fiscal owing to trece fast cu if do you wanted for ministerio publico wordo declara “niet ontvankelijk”, have to come cu motibonan huridico good splica. huez in his veredicto owing to as cuento cu thing advocate y fiscal owing to trece fast y owing to give saladin one castigo of 3 month kitando the time sit end. the time cu be kept in is become one castigo condicional. apart from this the have to pay one multa of 750 guilder, or sit 15 day at kia. This sort of sounds like 3 months probation and fine of 750 guilders for throwing an apparent fake Molotov cocktail at someone. I am wondering if Andre Samuel Saladin is Michael Saladin's son? Also wondering if Michael is still in jail? ORANJESTAD(AAN): Diabierna Nicolaas Lerone Jansen a presenta dilanti di mesa berde, despues cu el a wordo acusa di a drenta un cas na Seroe Colorado dia 18 di October, for di cual el a horta un laptop, un telefon celular, un camara, un television, un microwave, un aparato di feita y algun cos mas. Ademas di esaki el a wordo acusa di a saca un arma di candela pa propietario di e cas y a menaze cu e lo mata su famia, si e bisa algo. Den corte e acusado a bisa cu e no a kibra drenta. Ora cu el a yega hunto cu dos otro mucha homber, kendenan ta menor di edad, nan a haya e bentana habri caba y a drenta. Segun Jansen, ora cu nan tabata hortando, propietario di e cas a bin riba nan cu un machete. Ora cu e homber a yega cerca, el a saca e aparato di feita y e homber a wak e arma cu e tabata tin den su saco y a core bay. Huez a trece dilanti si cu un di e otro ladronnan mes a declara na polis cu Jansen a saca e arma di candela y punta esaki riba e homber. Huez a bisa tambe cu segun rapport di polis, e acusado mes a admiti cu el a saca e arma y punta esaki den direccion di e doño di cas. Huez a puntra Jansen unda el a haya e arma y el a bisa cu el a haya esaki for di un Colombiano. Huez a bise cu den rapport di pols tin para tambe cu el a busca e arma pa defende su mes, pasobra e ta bende marihuana. Den corte Jansen a bisa cu esaki no ta berdad. El a busca e arma djis pa play tuff dilanti di su amigonan. Segun Jansen, el a wordo influencia pa pelicula. Segun huez, doño di e cas a declara cu tur 3 persona den e cas tabata tin arma y cu un di nan a pone e arma na su cabez. Den corte e persona perhudica tabata mustra emociona, ora cu nan tabata papia tocante di e arma di candela. Ora cu el a haya oportunidad di papia tocante di si e ta desea entrega un demanda, el a bisa huez cu Jansen di berdad a menaze. El a bisa cu mama di e acusado ta yame tambe pa choller ora cu e wak e riba caya. Segun doño di e cas, Jansen for di algun dia prome a venena su 4 cachonan y cu Jansen ta conoci como un persona cu ta teroriza Seroe Colorado. Fiscal a bisa cu e caso aki ta hopi serio y cu Jansen despues cu el a wordo descubri den e cas y a menaza e doño di e cas, el a djis sigui coi articulonan for di e cas, manera nada no a pasa. Fiscal a exigi un castigo di 5 aña, mirando tambe algun otro acusacion di violencia cu tin contra Jansen. Abogado Nilo Croes a bisa huez cu bo por bisa cu Jansen a actua den defensa propio. Segun Croes, pregunta ta kico lo por a sosode, si su cliente no tabata tin e arma cune, mirando cu doño di e cas tabata tin un machete den su man. El a bisa tambe cu ta hopi reprochable cu e otro dos hobennan a wordo laga den libertad pa Ministerio Publico, despues di solamente algun dia. Abogado Croes a bisa huez tambe cu su cliente mester wordo considera como “first ofender”, pasobra e acusacionnan contra dje no a bin dilanti ainda den un caso. Fiscal a rabia bastante riba e echo cu e abogado a bisa cu Ministerio Publico a laga e dos otro hobennan bay despues di algun dia. Segun fiscal e abogado a haya un fax for di dje, den cual tin para exactamente despues di cuanto dia e otro hobennan menor di edad a wordo laga den libertad. Ademas di esaki no ta Ministerio Publico, sino Huez Comisario, kende a laga e hobennan bay. Abogado Croes a bisa cu e ta haya e exigencia di fiscal mucho halto. Huez ta bay duna su veredicto dia 29 di Juni. oranjestad(aan): diabierna nicolaas lerone jansen owing to present fast of table berde, after cu past owing to wordo acusa of owing to enter one cas at seroe colorado day 18 of october, for of cual past owing to steal one laptop, one telephone celular, one camara, one television, one microwave, one apparatus of shave y some cos more. apart from this past owing to wordo acusa of owing to saca one arm of candela for propietario of the cas y owing to menaze cu the will kill his family, if the tell algo. in corte the acusado owing to tell cu the not owing to break enter. hour cu past owing to arrive together cu two another boy, kendenan is younger of edad, they owing to achieve the window open end y owing to enter. according jansen, hour cu they was hortando, propietario of the cas owing to come on they cu one machete. hour cu he owing to arrive close, past owing to saca the apparatus of shave y he owing to look at the arm cu the was have in his saco y owing to core bay. huez owing to trece fast if cu one of the another ladronnan self owing to declara at police cu jansen owing to saca the arm of candela y punta this on he. huez owing to tell also cu according rapport of police, the acusado self owing to admiti cu past owing to saca the arm y punta this in direccion of the owner of cas. huez owing to ask about jansen where past owing to achieve the arm y past owing to tell cu past owing to achieve this for of one colombiano. huez owing to bise cu in rapport of pols have stop also cu past owing to busca the arm for defende his self, because the is sell marihuana. in corte jansen owing to tell cu this do not berdad. past owing to busca the arm immidiately for play tuff fast of his amigonan. according jansen, past owing to wordo influencia for pelicula. according huez, owner of the cas owing to declara cu all 3 person in the cas was have arm y cu one of they owing to place the arm at his cabez. in corte the person perhudica was show emociona, hour cu they was talk tocante of the arm of candela. hour cu past owing to achieve oportunidad of talk tocante of if the is desea entrega one demanda, past owing to tell huez cu jansen of berdad owing to menaze. past owing to tell cu mother of the acusado is yame also for choller hour cu the look at the on caya. according owner of the cas, jansen for of some day first owing to venena his 4 cachonan y cu jansen is conoci because; one person cu is teroriza seroe colorado. fiscal owing to tell cu the caso here is much earnest y cu jansen after cu past owing to wordo descubri in the cas y owing to menaza the owner of the cas, past owing to immidiately follow coi articulonan for of the cas, as nothing not owing to happen. fiscal owing to exigi one castigo of 5 year, mirando also some another acusacion of violencia cu have contra jansen. advocate nilo croes owing to tell huez cu could you tell cu jansen owing to actua in defence own. according croes, question is kico will can owing to sosode, if his cliente not was have the arm cune, mirando cu owner of the cas was have one machete in his hand. past owing to tell also cu is much reprochable cu the another two hobennan owing to wordo let in freedom for ministerio publico, after of only some day. advocate croes owing to tell huez also cu his cliente have to wordo considera because; “first ofender”, because the acusacionnan contra dje not owing to come fast still in one caso. fiscal owing to angry enough on the achievement cu the advocate owing to tell cu ministerio publico owing to let the two another hobennan bay after of some day. according fiscal the advocate owing to achieve one fax for of dje, in cual have stop exactly after of cuanto day the another hobennan younger of edad owing to wordo let in freedom. apart from this do not ministerio publico, but huez comisario, that owing to let the hobennan bay. advocate croes owing to tell cu the is achieve the exigencia of fiscal mucho high. huez is bay give his veredicto day 29 of june. ORANJESTAD(AAN):Keto bay dokternan ta trahando duro pa scapa bida di e hoben cu a ser tira algun dia pasa na Sta Cruz. E hobennan aki a ser tira pa e hoben Edmond Lo-A-Njoe na Macuarima. Su situacion tabata hopi serio pasobra el a haya tiro den barica cu a haci daño na diferente parti di su curpa. El a bora su tripa, higra, ader mayor y nier. Na mas cu un occasion dokternan mester a drenta sala di operacion despues cu e victima a ser interna pa bringa y trata na scapa su bida. E siman aki a habri y atrobe e victima ta den noticia pasobra el a perde un nier. Aki tambe sangramento interno a causa cu el a hera fayece. Expertonan medico di Dr Horacio Oduber Hospital ta den un lucha formal pa evita cu e hoben aki por perde su bida. E ta den cuido intensivo y critico unda no ta mira un mehoracion tampoco. Spera cu Dios ilumina e mannan di e dokternan pa asina nan por logra trece e stabilidad necesario pa bida di e hoben aki. oranjestad(aan):keto bay dokternan is trahando duro for scapa life of the young cu owing to being throw some day happen at sta cruz. the hobennan here owing to being throw for her young edmond lo-a-njoe at macuarima. his situation was much earnest because past owing to achieve tiro in barica cu owing to haci damage at various part of his curpa. past owing to bore his intestines, liver, vein parent y nier. at more cu one occasion dokternan have to owing to enter sitting-room of operacion after cu the victima owing to being interna for fight y deal at scapa his life. the week here owing to open y again the victima is in news because past owing to lose one nier. here also sangramento inner owing to cause cu past owing to hera fayece. expertonan medico of dr horacio oduber hospital is in one struggle serious for evita cu the young here can lose his life. the is in cuido intensivo y critico where do not see one mehoracion niether. wait for cu god ilumina the hands of the dokternan for so they can succeed trece the stabilidad necesario for life of the young here. ORANJESTAD (AAN): E momento a yega pa algo worde haci! Tin di cuminza for di paden di e nucleo y bin pafo. Den seno di Salubridad Publico tin di worde haci un investigacion pa pone Minister responsible pa negligencia, cu Diadomingo no tabatin ambulans disponible pa un situacion serio. No por ta asina cu pa motibo cu no tin ambulans disponible, debi cu e tabata ocupa cu un otro transporte... no por a haya servicio di ambulans pa bay cu urgencia pa salba bida di un ciudadano kende a confronta problema na Boca Catalina. Tabata un unidad di Polis cu ta pasando altura di Boca Catalina a worde para. Aki a bin tende cu un homber kende tabata snorkel den e area, diripiente a haya problema cu salud. Polis mesora a cuminza pidi pa un Ambulans. Aki e contesta a bin cu a laga hopi hende babuca. Ta un solo Ambulans tabatin pa sirbi 100.000 habitante. anto e no por duna asistencia e momento ey na Boca Catalina. Esaki ta exactamente loke algun turista recien a reclama caba. Nan ta haya cu e area mas panort di Aruba, mester ricibi sikiera un Police-Station y un Ambulance-Station pa yudanza mas rapido. No a keda otro alternativa pa yama pidi yudanza di un compania particular. Un personal di EMS kende tabata riba caya, a ricibi yamada y a acudi cu urgencia cu su equiponan pa cuminza traha. Mientras tanto, esnan na tera a logra trece e homber na canto y a cuminza practica CPR riba dje. Esnan cu e momento ta na e lugar di e sucedido tabata basta rabia pa e sistema di Siglo 21 na Aruba, esta cu no tabata tin ambulans disponible den un caso di urgencia. Ora cu e ambulans particular a presenta tur cu tin, esnan di EMS a take over y a sigui cu CPR riba e homber. Pero na yegada na Hospital, no por a haci nada mas. Docter a haye ta constata morto di Guillermo Juan Ricardo Medina naci na Aruba riba 2 di augustus 1950. E ta conoci na Aruba como “Capitan Medina”. Anto net Capitan Medina aki ta un ciudadano kende na numeroso ocasion den pasado tabata boga pa e placa di Belasting di pueblo worde usa na un forma cu ta beneficia pueblo. Envez cu placa di Belasting ta worde hinca den saco di gobernantenan... e tabata expresa na varios periodista cu placa tin di bay pa mihor School, mihor Cuido Medico, y mihor Ambulans. Net e ciudadano aki, kende semper a boga pa tin un mihor sistema di Ambulans na Aruba... net el a perde su bida debi cu no tabatin Ambulans di Gobierno e momento ey pa yude. Varios persona a comenta Dialuna, cu nan ta convenci cu si acaso a logra haya Ambulans na prome instancia... ainda bida di e ciudadano lo por a worde salba. Esnan cu pasa banda di Post di Ambulans lo por mira varios vehiculo staciona. Pero no ta paga overtime, pues no tin trahador pa core cune. Capitan Medina ta worde recorda como un persona kende semper tin pueblo y turismo na pecho. E tabata yuda semper pa promove Aruba cerca e bishitantenan. E mes tabatin un compania di Charter Yate, y tabata gusta conta tur turista extensivamente di loke e isla aki nifica pa su hendenan. E tabata un persona kende a cuminza reclama di e abuso di algun compania nobo di Watersports cu no ta nada beneficioso pa e pueblo Arubano. E tabata un persona kende semper ta duna su opinion na un forma responsable, y cu backup. E tabata semper contra tur clase di nepotismo, y sigur tabata condena semper cualkier deroche di placa cu Gobernantenan tabata haci nan mes culpable na dje. E negligencia di esnan responsible den e caso aki e minister tin di carga e responsabilidad ya cu e ta esun tin di carga e consecuencianan pa su maneho. oranjestad (aan): the instant owing to arrive for algo worde haci! have of cuminza for of inside of the nucleo y come pafo. in seno of salubridad publico have of worde haci one investigacion for place minister responsible for negligencia, cu diadomingo not had ambulance disponible for one situation earnest. not can is so cu for motibo cu not have ambulance disponible, debi cu the was ocupa cu one another transporte... not can owing to achieve servicio of ambulance for bay cu urgencia for save life of one ciudadano that owing to confronta problem at mouth catalina. was one unidad of police cu is pasando height of mouth catalina owing to worde stop. here owing to come hear cu one man that was snorkel in the area, diripiente owing to achieve problem cu salud. police at once owing to cuminza ask for one ambulance. here the contesta owing to come cu owing to let much person babuca. is one sun ambulance had for serve 100.000 inhabitant. then the not can give asistencia the instant ey at mouth catalina. this is exactly thing some tourist recien owing to reclama end. they're achieve cu the area more panort of aruba, have to ricibi sikiera one police-station y one ambulance-station for yudanza more rapido. not owing to stay another alternativa for calling ask yudanza of one compania particular. one personal of ems that was on caya, owing to ricibi call y owing to acudi cu urgencia cu his equiponan for cuminza work. all the time, esnan at ground owing to succeed trece he at canto y owing to cuminza practica cpr on dje. esnan cu the instant is at the lugar of the sucedido was enough angry for her sistema of siglo 21 at aruba, esta cu not was have ambulance disponible in one caso of urgencia. hour cu the ambulance particular owing to present all cu have, esnan of ems owing to take over y owing to follow cu cpr on he. but at arrival at hospital, not can owing to haci nothing more. docter owing to haye is constata dead of guillermo juan ricardo medina naci at aruba on 2 of august 1950. the is conoci at aruba because; “capitan medina”. then just capitan medina here is one ciudadano that at numeroso ocasion in pasado was boga for her coin of tax of people worde using at one form cu is beneficia people. envez cu coin of tax is worde hinca in saco of gobernantenan... the was expresa at several journalist cu coin have of bay for mihor school, mihor cuido medico, y mihor ambulance. just the ciudadano here, that always owing to boga for have one mihor sistema of ambulance at aruba... just past owing to lose his life debi cu not had ambulance of gobierno the instant ey for yude. several person owing to comenta monday, cu they're convenci cu if acaso owing to succeed achieve ambulance at first instancia... still life of the ciudadano will can owing to worde save. esnan cu happen near of post of ambulance will can see several vehiculo staciona. but do not pay overtime, then not have trahador for core cune. capitan medina is worde recorda because; one person that always have people y turism at pecho. the was help always for promove aruba close the bishitantenan. the self had one compania of charter yacht, y was like count ; all tourist extensivamente of thing the island here nifica for his hendenan. the was one person that owing to cuminza reclama of the abuse of some compania new of watersports cu do not nothing beneficioso for her people aruban. the was one person that always is give his opinion at one form responsable, y cu backup. the was always contra all clase of nepotismo, y assure was condena always cualkier deroche of coin cu gobernantenan was haci they self culpable at dje. the negligencia of esnan responsible in the caso here the minister have of carga the responsabilidad already cu the is esun have of carga the consecuencianan for his maneho. I can't glean much of the Pap language in posts above, so I can't comment on the case. But I sure am happy they got Lorenzo. I'm telling you, the pics of the three big bags of pot just blew me away. They look to be as high as the table in the background. Most tables are around 30" tall. I would say they are worth a great deal of money, maybe millions. Here in Los Angeles, one ounce of the very best good, fresh pot costs $500. And one ounce is not very big. I cannot imagine how many ounces are in those bags. ORANJESTAD – With much interest, secretary of state Ank Bijleveld-Schouten of Kingdom Relations ( CDA ) follows the case around the Aruban governmental party MEP boycotting Diario, but she will not take any actions in this. “The primary responsibility for guaranteeing the implementation of the democratic principles, is with the countries selves”, indicated Bijleveld in a letter to Andin Bikker, chair of the extraparliamentary group Partido Democracia Real. Bikker has asked the Kingdom’s Council of Ministers on April 21st to take actions against MEP’s call for a boycott. The party decided to do this after a number of not-liked publications of Diario. In his request, Bikker refers to a letter dated April 17th, in which the Inter American Press Association (IAPA) declared that MEP’s call to boycott Diario means violation of article 5 of the Treaties of Chapultepec. According to Bijleveld, this declaration is judicially not binding however. “The guarantee-function in article 43 of the Statute that you refer at, guarantees the implementation of the democratic principles of the constitution. The primary responsibility for this is with the countries themselves though. The appropriate measures from the Kingdom are only taken when it appears that a country does not sufficiently interpret these structurally. But that is not the case here”, wrote Bijleveld to Bikker. ORANJESTAD (AAN): Un caso serio a tuma luga Dialuna anochi na altura di Pacifico Restaurant na Paradera. Patruya di Santa Cruz a worde dirigi cu urgencia na e direccion y a bin topa un homber mal bati y maltrata seriamente fuera tabata tin testigo presente. E victima di inicialnan E.G.K. di 31 aña segun e relato policial ta menciona, a worde agredi pa un grupo di mucha homber. Segun calcula e grupo ta consisti di 4 pa 5 persona ta den un Suzuki Jimny color blanco. Un di ocupantenan a baha abao di e vehiculo y dal E.G.K. cu un boter di cerbez den cabez. E victima E.G.K. a purba di core, pero e otro miembronan di e grupo a core su tras y un di nan a dale aparentemente cu bate preto na diferente biaha cu e obheto. Despues di a comete e barbaridad aki e grupo a baha na awa den e Suzuki Jimny color blanco cu number A-47401 direccion Oranjestad. Via Central di Polis a logra di controla e number y aparentemente esaki ta registra riba un tal R.E. Mientras Recherche tambe a presenta na e lugar y mesora a compila tur dato relaciona cu maltrato serio. A resulta cu ta un cabel di coriente, uno di esnan den e grupo a usa como arma pa comete e acto violento aki. Huez lo tene na consideracion cu e cabel aki ta un arma fuerte tambe. E victima a ricibi sla formal na pia y brazanan fuera cap na cabez, el a laga sa di no conoce e hendenan Cu tur su dolor e victima a worde transporta pa hospital, parce pero no a keda confirma cu el a keda interna. Recherche lo ta riba un pista pa pone man riba esnan responsible di maltrata serio y por considera esaki como un intento di asesinato. Nan lo bay presenta dilanti Huez, y nan wowo lo lombra pa basta tempo sigur den Prison di KIA. Nan tin di djis prepara nan maleta di awor caba. oranjestad (aan): one caso earnest did take luga monday night at height of pacifico restaurant at paradera. patrol of santa cruz owing to worde dirigi cu urgencia at the direccion y owing to come come across one man bad beat y maltrata seriamente fuera was have witness present. the victima of inicialnan e.g.k. of 31 year according the relato policial is menciona, owing to worde agredi for one are of boy. according calcula the are is consisti of 4 for 5 person is in one suzuki jimny color blanco. one of ocupantenan owing to descend abao of the vehiculo y strike e.g.k. cu one boter of cerbez in cabez. the victima e.g.k. owing to try of core, but the another miembronan of the are owing to core his slow y one of they owing to dale apparently cu bate black at various trip cu the obheto. after of owing to comete the barbaridad here the are owing to descend at water in the suzuki jimny color blanco cu number a-47401 direccion oranjestad. via central of police owing to succeed of controla the number y apparently this is registra on one such r.e. while recherche also owing to present at the lugar y at once owing to compila all dato relaciona cu maltrato earnest. owing to resulta cu is one cabel of coriente, uno of esnan in the are owing to using because; arm for comete the acto violento here. huez will as at consideracion cu the cabel here is one arm strong also. the victima owing to ricibi sla serious at leg y brazanan fuera cap at cabez, past owing to let know of not conoce the hendenan cu all his dolor the victima owing to worde transporta for hospital, seems but not owing to stay confirma cu past owing to stay interna. recherche will is on one pista for place hand on esnan responsible of maltrata earnest y can considera this because; one attempt of asesinato. they will bay present fast huez, y they eye will lombra for enough time assure in jail of kia. they have of immidiately prepara they trunk of now end. I felt very uneasy during my last trip to the island in March. My rental car was surrounded twice as I drove by the RIU resort during a labor change...both times workers jumped in front of my car while other workers tried surrounding it in hopes I guess that they could stop the car...little did they know that I would have hit them if they didn't get out of the way. Also, another PLBR member was mugged on the sidewalk while walking back from the Westin and was badly beaten and robbed by three men who disappeared into the RIU construction fenced area.....also, very close friends were robbed in their rental home while they slept and their jewerly, camera, some cash, binoculars, etc along with their wallets were stolen. So, I was A LOT more aware this trip and had creepy feelings in the evening everytime we went out. Will it stop me from returning? Not in 2008 it won't, but down the road it might. I'm from NY and I'm quite used to feeling creepy, but I don't need to spend this kind of money in a place where my concerns were laughed at to feel creepy. I saw no visability teams on Palm Beach the whole three weeks I was there and no police presence either. Found this while reading around. It is from 2004. Not sure if it has been documented. The couple was staying someplace located downtown. They woke up one morning noticing that some of their jewelry were on the floor near the dresser instead of on TOP of the dresser where they placed it the night before after returning from dinner. As they were picking up the jewelry, they also noticed that some of their clothes from the dresser were on the floor. Come to find out their passports & money were gone. Evidently, someone had broken into their bedroom while they were sleeping and had stolen them. That day the couple went straight to the police station to file a report, but they didn't have much luck getting the police to search for the criminals. The couple called their parents to ask them to get copies of their passports b/c w/o them they wouldn't be able to get out of Aruba, & also to send them more money. By this time 3 weeks had passed--still waiting for copies of their passports and to find out any news of finding the criminals. As the couple went strolling downtown to try to get their minds off the matter, they ran into a man who was trying to sell them "something". When the couple refused, he then pulled out another item. That other item came out to be their passports. He was trying to sell them for $75 each. The couple couldn't believe it. Luckily, the man found a policeman not too far away from them and told him the situation. The policman didn't do anything. Didn't arrest the man, nor did he take the stolen passports from the seller. After 1 month on the island, on my way to the beach I bumped into the couple again asking them what became of the situation. They said that they were finally leaving that day since they finally received copies of their passports so that they could leave the island and told me that they would never come back to Aruba again b/c of how ignorant the police were in the matter. It is unfortunate that something like that has to happen, but it does happen. Explosion fuerte scucha te na Noord! Granada similar cu loke ta usa na Marinierskazerne! ORANJESTAD (AAN): Ultimo simannan, cada biaha Polis ta bay na un adres na Paradera pa asina intermedia den un caso lamentable. E conocido recidivista Pito Lacle ta bay molestia su mama na Paradera 109. Cada biaha ora cu Polis yega, ya caba Pito a core bay sconde. Nunca nan no ta logra haye pa pone man riba dje. Asina e ta sigui ‘reta’ autoridad cada rato. E sa bombardea e cas cu piedra, y comete destruccion eynan. Pero loke a socede Dialuna madruga a bay demasiado extremo. Tabata algo despues di 2:15’or di madruga, cu Polis a bolbe haya informe cu na Paradera 109, tin problema atrobe. E conocido Pito un biaha mas tabata busca problema cu su mama. Un rato despues, esnan bibando den e area a spanta pa e sonido. Un explosion fuerte y poderoso a sacudi tur cas eybanda. A resulta cu Pito a haci uso di un granada di man, y a lanza esaki riba e cas. E granada a explota, y laga tur hende ‘zonza’. Polis a bay cu rapidez y e madruga aki realmente no a ripara mucho “daño” cu a worde cometi. Ningun hende a resulta herida. Ora cu solo a sali mainta, e ora numa habitantenan a bin realiza con grandi e daño cometi ta! Bentananan kibra, y algun a sali for di scharnier. Daño extenso riba dak, y mucho mas. DIARIO tabata presente ora cu demas autoridad a start investigacion. Diripiente a bin topa cu un fragmento cu ta procedente di e granada di man. Ta trata di e ‘handle’ cu bo ta wanta e granada cune, ora cu bo a caba di kita e ‘pin’. Riba e handle aki tin un sticker cu un cifra. E cifra aki a resulta di ta e “Bunker Number” di Marinierskazerne Savaneta. Tog te cu Dialuna atardi no por a haya confirmacion oficial si e granada di man cu a worde lanza riba un cas na Paradera, ta procedente di Marinierskazerne. Pero DIARIO tin informe cu e ta uno similar cu nan ta usa eyden. Hecho ta cu Recherche a involucra Marechaussee (polis militar) staciona na Base Militar na Savaneta relaciona cu e caso serio aki. E explosion a sacudi tur cos rond di Paradera 109. E sonido fuerte a worde scucha basta leu, te na Noord. Mientras experto den municion di guera tambe lo duna su asistencia pa determina si aki lo port a trata di un artefacto military abase di serial por saca afor ki fabricacion, cual pais a cumpra esaki y ki proposito. Arma mes ta worde control rigurosamente. Menos ainda despues di 11 di September henter mundo a cuminsa tuma medidanan di seguridad. Tanto na aeropuertonan y hafnan. Masha hopi inversion esaki a exigi pa seguridad. Si resulta cu e handgranaat a worde saca for di Marina real na Savaneta por spera cu lo inicia cu un investigacion. Pero si ta corecto esnan encarga cu magazijn na unda e handgranaat ta worde warda tambe a faya si e no a reporta esaki na su superiornan y autoridad local. Den pasado tambe a yega di desaparece municion for di Kazerne. For di Curaçao e tempo ey Marechaussee tambe a viaha pa Aruba pa inicia cu nan investigacion. Despues di tempo un tip a drenta na mesa di redaccion na Diario y reporteronan a bay na e lugar indica Barcadera den boca di un tanki bashi lo boso lo localiza e municionnan. Dos reportero mesora a bay y enberdad a descubri e municionnan. Robby Burleson a bay warda di Balashi pa bati alarma, mientras su colega Django Simoons a keda vigila despues cu el a constata esaki no tabata forma peliger pa explota. El a percura tambe pa ningun persona yega cerca cu no ta autoridad competente. Y asina tambe a keda confirma cu boshi militar y expertonan compania pa polis a inspecta e municionnan y a hiba nan kazerne back. Y alavez nos a haya razon apesar e tempo ey a keda desmenti pa alto mando militar cu a desaparece municion for di Savaneta Kamp. Te ainda Pito Lacle ta scondi. Autoridad ta buscando e persona aki pa responde pa e acto serio aki. granada similar cu thing is using at marinierskazerne! oranjestad (aan): ultimo simannan, cada trip police is bay at one adres at paradera for so intermedia in one caso lamentable. the conocido recidivista pito lacle is bay molestia his mother at paradera 109.
cada trip hour cu police arrive, already end pito owing to core bay sconde. never they do not succeed haye for place hand on dje. so the is follow ‘reta’ autoridad cada rato. the know bombardea the cas cu stone, y comete destruccion eynan. but thing owing to socede monday madruga owing to bay demasiado extremo. was algo after of 2:15’or of madruga, cu police owing to go back achieve informe cu at paradera 109, have problem again. the conocido pito once more was busca problem cu his mother. one rato after, esnan bibando in the area owing to spanta for her sonido. one explosion strong y powerful owing to sacudi all cas eybanda. owing to resulta cu pito owing to haci usage of one granada of hand, y owing to lanza this on the cas. the granada owing to explota, y let everybody ‘zonza’. police owing to bay cu rapidez y the madruga here genuinely not owing to ripara mucho “daño” cu owing to worde cometi. none person owing to resulta injury. hour cu sun owing to leave morning, the hour numa habitantenan owing to come realiza con big the damage cometi is! bentananan break, y some owing to leave for of scharnier. damage extenso on roof, y mucho more. daily paper was present hour cu other autoridad owing to start investigacion. diripiente owing to come come across cu one fragmento cu is procedente of the granada of hand. is deal of the ‘handle’ cu are you wanta the granada cune, hour cu you have end of less the ‘pin’. on the handle here have one sticker cu one cifra. the cifra here owing to resulta of is the “bunker number” of marinierskazerne savaneta. tog till cu monday nightfall not can owing to achieve confirmacion oficial if the granada of hand cu owing to worde lanza on one cas at paradera, is procedente of marinierskazerne. but daily paper have informe cu the is uno similar cu they're using eyden. mature is cu recherche owing to involucra marechaussee (polis militar) staciona at base militar at savaneta relaciona cu the caso earnest here. the explosion owing to sacudi all cos rond of paradera 109. the sonido strong owing to worde listen enough far, till at north. while experto in municion of war also will give his asistencia for determina if here will port owing to deal of one artefacto military abase of serial can saca afor what fabricacion, cual country owing to cumpra this y what proposito. arm self is worde control rigurosamente. less still after of 11 of september all world owing to cuminsa take medidanan of seguridad. tanto at aeropuertonan y hafnan. very much inversion this owing to exigi for seguridad. if resulta cu the handgranaat owing to worde saca for of navy regal at savaneta can wait for cu will inicia cu one investigacion. but if is corecto esnan encarga cu magazijn at where the handgranaat is worde keep also owing to abort if the not owing to reporta this at his superiornan y autoridad local. in pasado also owing to arrive of desaparece municion for of kazerne. for of curaçao the time ey marechaussee also owing to viaha for aruba for inicia cu they investigacion. after of time one tip owing to enter at table of redaccion at daily paper y reporteronan owing to bay at the lugar indica barcadera in mouth of one tanki bashi will you will localiza the municionnan. two reportero at once owing to bay y enberdad owing to descubri the municionnan. robby burleson owing to bay keep of balashi for beat alarma, while his colega django simoons owing to stay vigila after cu past owing to constata this not was form danger for explota. past owing to percura also for none person arrive close cu do not autoridad competente. y so also owing to stay confirma cu boshi militar y expertonan compania for police owing to inspecta the municionnan y owing to take away they kazerne back. y alavez we owing to achieve razon despite the time ey owing to stay desmenti for alto command militar cu owing to desaparece municion for of savaneta kamp. till still pito lacle is scondi. autoridad is buscando the person here for responde for her acto earnest here. Hand grenade thrown at (or into) a house at 109 Paradera. No one injured but considerable damage to the house. I believe it's saying that the house was occupied by Pita Lacle's mother. Page created in 2.247 seconds with 19 queries.